RAE ARMANTROUT has published 13 books of poetry. 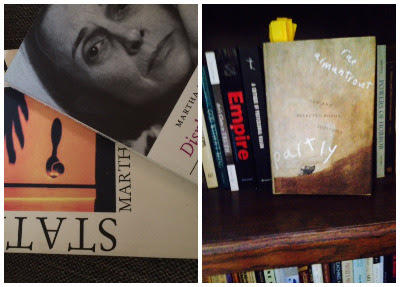 Her most recent collection, Partly: New and Selected Poems, was published by Wesleyan U.P. in 2016. Her poems have recently been collected in Spanish editions: Necromancia (Spain, 2015): and Rae Armantrout: Poemas (Spain, 2014). In 2015 she was awarded the Levinson Prize for best poems in Poetry Magazine. Her book Versed (2009) received the Pulitzer Prize and the National Book Critics Circle Award in 2010. She was also the recipient of a Guggenheim Fellowship in 2008 and A Foundation for Contemporary Arts Award in 2007. Her work has appeared in many journals and anthologies. MARTHA RONK's forthcoming collection of poetry Ocular Proof from Omnidawn focuses on photography and comes out this fall. A recent chapook, familiar/unfamiliar, was released by Magra Books this summer, and her 2015 volume Transfer of Qualities was long-listed for National Book Award last year. She lives in Los Angeles, where she is professor at English at Occidental College. Thanks sir for sharing this poetry books publishing info with us.